I just love ancient artifacts. So I was very pleased when a family member gave me the gift of a sculpture he made. It was one of a series of three sculptures, all slightly different… all excellent. 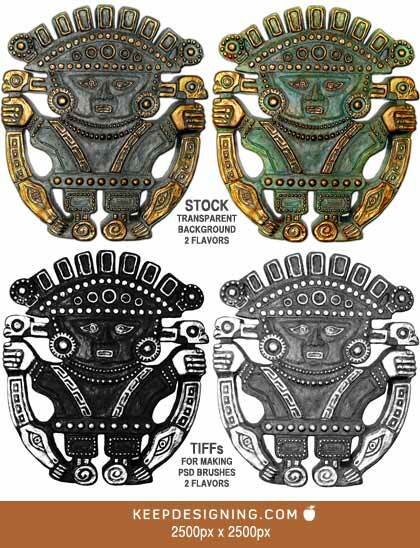 The figure is a rendition of traditional Peruvian/Pre-Columbian artifacts. Hand crafted of clay and painted with gold accents, it has become a favorite item of home decor. It’s truly a museum quality piece from the hands of a very talented artisan hobbyist, who seeks no acknowledgment here for the work. It’s been hanging in my studio for several years, and now I’m sharing with the graphic design community this free stock photo I took (2500×2500) and 2 high resolution TIFFs for making Photoshop brushes. They’re not exactly assets for everyday design work, like many of our free vectors are, but the iconic look has tons of visual character. I added some lighting and color effects to the original, so there are two versions in the layered PSD stock photo download. Let us know if you end up using it for either personal or commercial works. Enjoy! this is not cool. im doing a reserch project and i need to find some art that i can re creat…. im a freshman in high school and this is a huge!!! gradee…..
Sure looks more like a Lambayeque Peruvian sculpture than Maya, like ones seen on Tumis (curved knives). that those clay sculptures are not mayan. 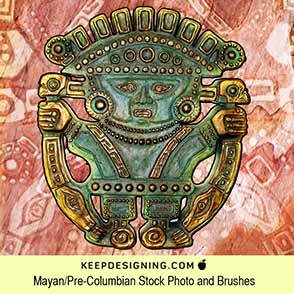 they are are from the mochica civilization of peru. Thank you for the clarification @MFC @not mayan. I’m no expert and I appreciate the knowledge you shared! Unique piece of pc art here, but why is this Greek pattern stripes (also adopted by versace brand) on Peruvian guy’s chest there? I think it is important to keep every culture’s features apart!